At CES 2014, Sony finally announced their plans to stream video games, a promise made when they revealed its PlayStation 4 earlier last year. The idea was to use Gaikai, a video game streaming company that Sony purchased for $380 million back in 2012, to bring the PlayStation’s large library of classics to the PlayStation 4, effectively solving the lack of backwards compatibility. Sony’s announcement of PlayStation Now, the official name of the streaming service, is a bit larger in scope than originally thought. The plan is to deliver PlayStation gaming content not just to PlayStation centric devices such as the PlayStation 3, 4, and Vita, but to every screen in the home, including the television, tablet, and phone. It’s a bold plan that can revolutionize the way we consume video games similar to how Netflix changed the home movie industry by delivering content across multiple hardware platforms through the Internet. Playing on a TV is as simple as connecting a controller to the TV via Bluetooth, starting the PlayStation Now app, and loading up a game. Sony recommends at least a 5 Mbps Internet connection with the quality of the compressed textures being slightly lower compared to their native counterpart. The service sounds promising, but in order to succeed, Sony has some tough hurdles to overcome including latency, the lack of infrastructure for high speed internet, and licensing. The idea of delivering video games to users without very specific hardware specifications through the Internet is a simple one. Browser games played around with the idea and have made large advancements in the past couple of years. However, as any gamer who plays online knows, the issue is in the latency – the time it takes for players to hit a button and it be recognized by the server and processed correctly. In many games, particularly fighting games where 1-frame links are the norm, players live and die by the amount of latency present. Because PlayStation Now processes the game on its side and delivers the contents to players via streaming, there is bound to be some latency. Early impressions reported little latency, but keep in mind that this is a closed tech demo and the final service may end up being very different with thousands of players streaming their favorite games to their device of choice. Not only that, but all of the games played, The Last of Us, God of War: Ascension, The Puppeteer and Beyond: Two Souls are all single player games that do not depend heavily on interacting with other players. Playing an online game with others using this service, for example a FPS such as Battlefield, or a MMO such as Final Fantasy XI may pose extra problems. Some of these latency issues may be solved if Sony can overcome its second challenge: the lack of infrastructure for high speed internet. It’s a fact: America’s internet infrastructure is pitiful. According to Ookla, the company behind the popular app and site SpeedTest, America ranks 31st in the world for download speeds, behind much of Europe and Southeast Asia. PlayStation Now depends heavily on consumers having cheap and fast internet. This is currently a hot topic since about one-third of Americans in rural areas do not have a broadband connection and the price of “fast” internet remaining high. A (up to) 50 Mbps connection from Time Warner Cable runs at $74.99 per month while Google Fiber’s 1 Gbps connection is a mere $70 per month. Unfortunately, fast, affordable internet such as Google Fiber is only available in three areas in the U.S. right now. Building the infrastructure to support a download heavy service such as PlayStation Now will be imperative to its success. Surprisingly, PlayStation Now isn’t the only tech Sony is driving that requires this infrastructure. The delivery of 4K (ultra HD) content will also need these high speed cables to stream high quality movies and videos to the coming wave of early Ultra HDTV adopters. Hopefully, these new services and technologies will drive the demand up for high speed internet and providers will step in to deliver, creating competition that will drive down the price of these speeds. The final piece of the puzzle Sony needs to figure out is the licensing of the library. There is no disagreement that the PlayStation has one of the most robust libraries of classic games including recent hits such as The Last of Us to early giants like Final Fantasy VII. However, bringing this library into the PlayStation Now service will be no easy feat. Much like today’s movie and TV streaming services, licensing issues prevent many classics from being available. Netflix just lost the license for a number of movies when the calendar flipped from 2013 to 2014. Licensing problems are already present in the gaming industry with Activision and Capcom taking down their Marvel-licensed games from the PlayStation Network in December. Licensing is also the reason why some games have appeared digitally in the Japanese PlayStation Store and not in the American PlayStation Store – and why some games have never appeared digitally in the store. Of course, Sony does not need to bring 100% of its titles to the service for it to be a success, but it will need to bring a lot of the heavy hitters and it will need to be at a reasonable price. This is still the early stages of the PlayStation Now service with betas starting at the end of January and a rollout to consoles in the summer with TVs and other devices to follow later this year, so there is still some time to address many of these pieces. 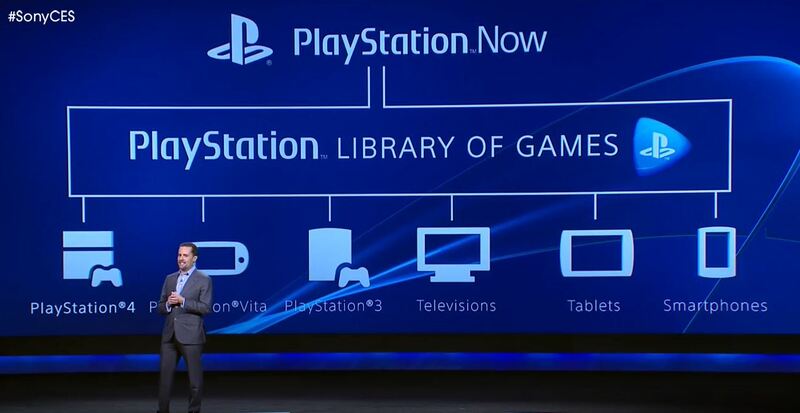 I imagine many of these will take many years to figure out, but the idea behind PlayStation Now is a solid one. It’s an idea that moves the PlayStation brand away from the dedicated console machine we know today and into the future of streaming and delivering content to as many screens as possible. In the mean time, we will have to salivate at the bold potential of the idea and look forward to playing many of Sony’s acclaimed first party titles through the Internet.